May called for a system of “mutual recognition ” on the trade deal with EU after Brexit. That is, the two trading partners should recognize each other rule, yet they’re free to adopt their own ways. The system is to be overseen by a joint UK-EU court. EU negotiator Michel Barnier’s chief adviser Stefaan de Rynck blasted it as a “failed” system. He said “there was a time we thought it would lead to market efficiency, but with the financial crisis we have gone for an approach of more harmonization and centralization and more EU bodies overseeing that and stronger powers for those bodies.” And, “if you are in a very integrated market with a third country but you don’t have the joint enforcement structures, then you can see the potential for all kinds of difficult situations. Rees-Mogg could back May’s Brexit deal with reasonably effective time limit on Irish backstop. Jacob Rees-Mogg, a high profile Brexiteer Conservative, said that the could back Prime Minister Theresa May’s Brexit deal if there is a reasonably effective time limit on the Irish backstop. Rees-Mogg told BBC ratio that “I can live with the de facto removal of the backstop…. I mean that if there is a clear date that says the backstop ends, and that is in the text of the treaty or equivalent of the text of the treaty”. May also reiterated her opposition to a second referendum as that would “divide our country” and require a delay to Brexit. Separately, a cross party group of Conservative and Labour MPs are seeking to amend the government’s Finance Bill to ensure the “no deal” provisions in it can only be implemented if Parliament votes to allow it. Debate on the Brexit agreement will resume this Wednesday, with the vote due in the week beginning January 14. Regarding growth, he said “it’s going to be a good year, and part of that is fiscal stimulus”. However, the economy is “going to slow in 2019 and 2020” and “that’s the standard forecast that’s out there”. Separately, Bullard told Bloomberg TV that Fed should not do anything that knowingly invert the yield curve. This sort of echoes comments of Atlanta Fed President Raphael Bostic. Released from US, factory orders rose 0.7% in June, in line with expectation. US initial jobless claims rose 1k to 218k in the week ended July 28. Four-week moving average of initial claims dropped -3.5k to 214.5k. Continuing claims dropped -23k to 1.724m in the week ended July 21. Four-week moving average of continuing claims dropped -4.5k to 1.74175m. NAFTA negotiation between US and Canada continued to drag on with no concrete results after yesterday’s meeting. Canadian Foreign Minister Chrystia Freeland just repeated her words that “we are making good progress,” discussions were “constructive and productive” with “goodwill on both sides.” But the key issues were unresolved and expectation is low for a deal to be made this week. The Chapter 19 dispute resolution mechanism remained a sticky point. Canadian Prime Minister Justin Trudeau insisted on having the mechanism as Trump is a president “who doesn’t always follow the rules as they’re laid out.” Another deadlock is diary quota which Canada might concede some ground, but based on condition that others issues are satisfactorily resolved. The third issue is the cultural exemptions to protect Canadian media company, which Trudeau said they’re important to Canada’s national sovereignty and identity. DOW sees some solid buying today, up 200 pts at the time of writing. But it’s more like a recovery that corrects the fall from 25800.35 to 24217.47. For now, the recovery could extend to 55 H EMA an or above. but strong resistance is likely between 25000/25200. Another fall to 23360.29 is still in favor for the near term. New York Fed President John Williams said yesterday that the US is now in a state of “overall strong economy”. And, “employers are now struggling to fill job openings.” He called it a “great time for businesses to set up” with internships, training programs and school partnerships. In August, US headline PPI dropped -0.1% mom versus expectation of 0.2% mom rise. Year-over-year rate also slowed from 3.3% yoy to 2.8% yoy, below expectation of 3.2% yoy. Core PPI dropped -0.1% mom versus expectation of 0.2% mom. Year-over-year rate also slowed from 2.7% yoy to 2.3% yoy, below expectation of 2.8% yoy. That’s also the first monthly decline in 1.5 years February 2017. Decline in food prices and trade serves offset the increase in energy costs. Dollar trades mildly lower against Yen after the remains, but stays range-bound against others. movements in some emerging markets. Though, the latter have “limited” effects on the global economy at this point. On monetary policy, since there is “still a long way” to meet 2% inflation target, it is “appropriate to pursue powerful monetary easing with persistence under the current guideline”. But BoJ also noted that “the reason for the sluggishness in prices is unlikely to be merely a shortage of demand”. Therefore, “it is not appropriate to adopt a policy that would forcibly push up demand in a short period of time. Full summary of opinions here. 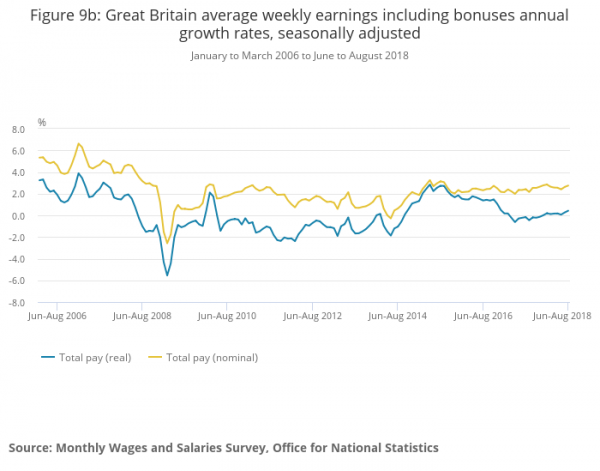 UK unemployment rate was unchanged at 4.0% in August, matched expectations. 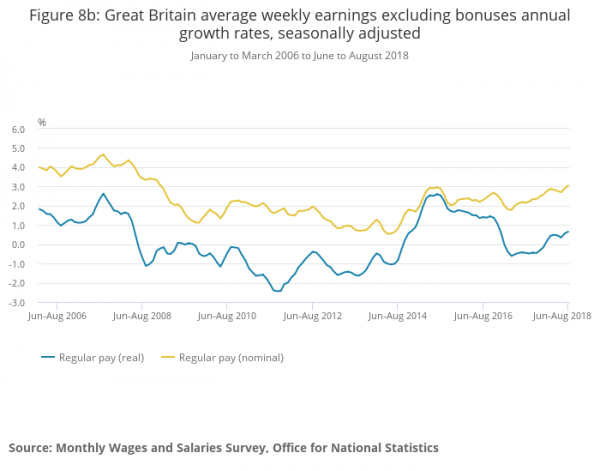 Wage growth, on the other hand, is an upside surprise. 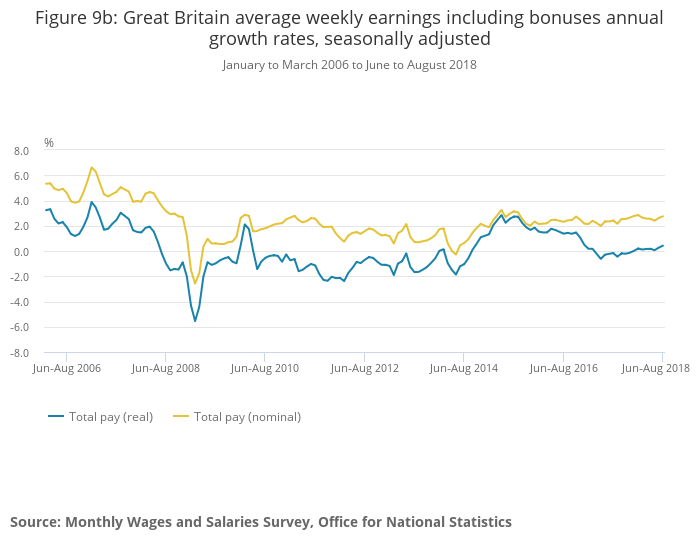 Average weekly earnings including bonus rose 3.7% 3moy in August, above expectation of 2.4% 3moy. 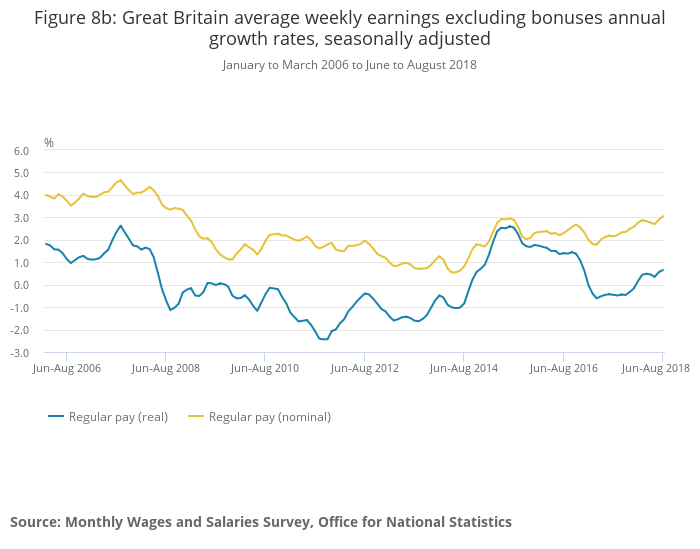 Average weekly earnings excluding bonus rose 3.1% 3moy, above expectation of 2.8% 3moy. In September, claimant counts rose 18.5k, above expectation of 4.5k. Full release here. 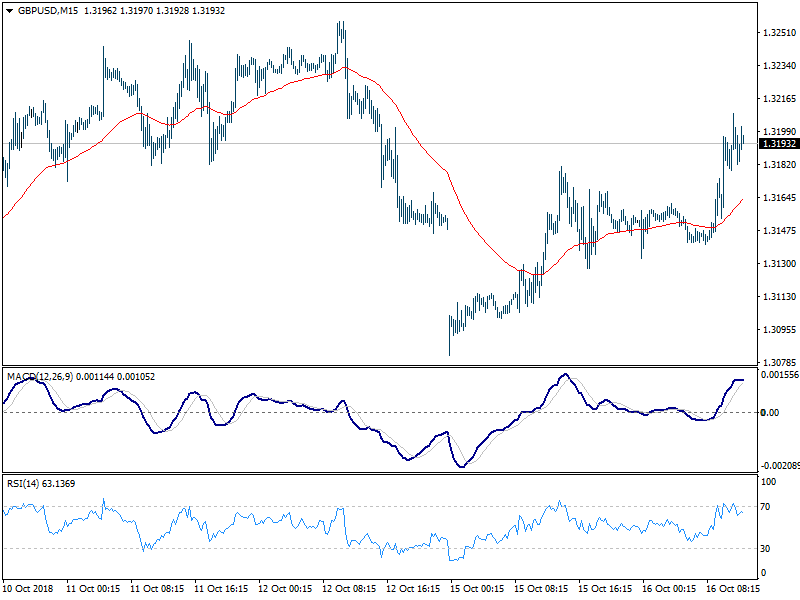 GBP/USD edged higher after the release. But upside is limited so far.. The report also noted that “despite repeated U.S. engagement efforts and international admonishments of its trade technology transfer policies, China did not respond constructively and failed to take any substantive actions to address U.S. concerns.” And, China, “made clear – both in public statements and in government-to-government communications – that it would not change its policies in response to the initial Section 301 action.” The report also said “China largely denied there were problems with respect to its policies involving technology transfer and intellectual property”. Trump close ally House Republican Steve Scalise also warned that “there is a growing frustration with many in Congress regarding Canada’s negotiating tactics.” And, “members are concerned that Canada does not seem to be ready or willing to make the concessions that are necessary for a fair and high-standard agreement.” But it’s unsure how much this such a view is shared among congressmen. Full 23-page speech of Yutaka Harada on Economic Activity, Prices, and Monetary Policy in Japan. Some Conservative MPs are reported to ask May to pull the Brexit meaningful vote on Tuesday, because it’s rather meaningless to hold a vote that will certainly be defeated. But there were also talks that May is planning to push for a vote on a “hypothetical” deal on Tuesday. It could be with a certain Irish backstop arrangement with Attorney General Geoffrey Cox’ input. Then EU could be forced to concede should there be a Commons majority. Kuroda remained optimistic that “wage and price growth will likely accelerate” and lift inflation to 2% target eventually. But that change of doing that any time during fiscal 2020 is “slim”. Chinese stocks are enjoying a strong rally today. The Shanghai SSE breaches 2800 handle and is holding 2% gain. Tech stocks led the way higher as the government indicated strong focus in development in the sector. Yesterday, the State Council renewed the ” National Science, Technology and Education Leading Group” to “National Science and Technology Leading Group”, showing the dedication in science and technology. The group is headed by Premier Li Keqiang with Vice-Premier Liu He as deputy. Fourteen high level officials from National Development and Reform Commission, the Ministry of Education, and the Ministry of Science and Technology are also part of the group. The major responsibilities of the group include studying and reviewing national strategies, plans and major policies for sci-tech development; deliberating major national scientific tasks and projects, and coordinating major sci-tech affairs among ministries, departments and local authorities. Without any fundamental change regarding Irish backstop, there is practically no chance for May to get her Brexit deal through the Parliament on March 12, next Tuesday. A vote on no-deal Brexit will then be held on March 13 to see if there is explicit consent on this path. If not, there will be another vote on Article 50 extension on March 14.